Websites, including this one, love to share articles about how to run faster, get stronger, and avoid injury. They talk about hills, trails, and training plans, and while those can have major impacts on your running, they pale in comparison to one key ingredient: Your running form. Making slight adjustments to your running form is probably the most important, and easiest, way to prevent injury and become a more efficient runner. By not paying attention to your form, it’s easy to create habits that stick around for life. But you’re reading running blogs right now because you care enough not to let that happen. Just by focusing on slight adjustments to your form, you can make small changes that have a massive impact on you as a runner. 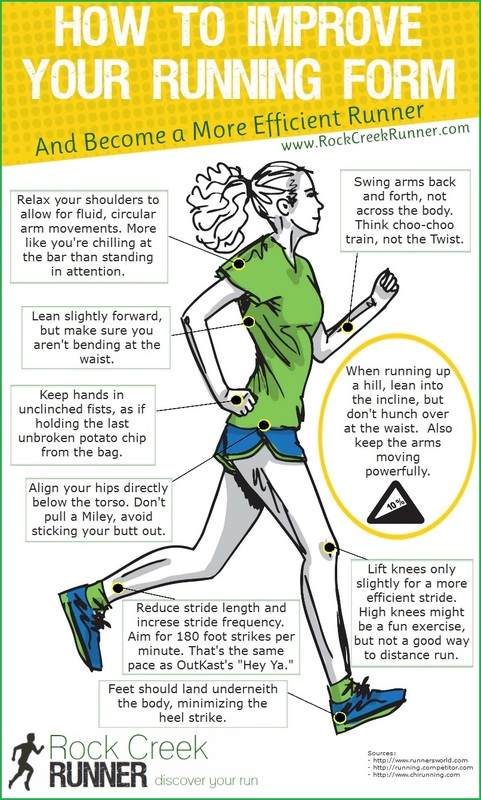 In the infographic below, I’ve pointed out several ways to improve your running form and become a more efficient runner. I recommend focusing on just one or two at a time, and constantly reminding yourself to focus on that adjustment over the course of several runs. Once you have that part down without having to focus on it, move on to something else. It’s true that no running form is perfect for everyone, but by following these simple rules, you’ll start running more efficiently and effectively. How could you pass that up?